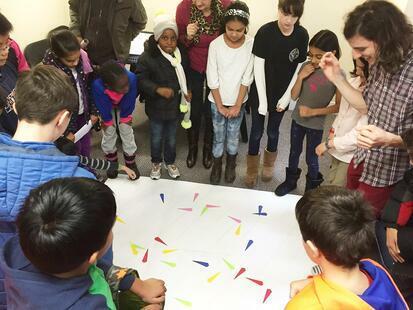 From helping students to understand the basic mathematical concepts to developing creativity in solving complex real-life problems, our goal is to encourage logical reasoning, analytical thinking, and independent learning. We want your children to embrace math, appreciate its beauty, and become life-long advocates of the importance of mathematics. Our program motivates students to excel in their regular math classes by building their confidence and understanding of math concepts. Our systematic approach to the learning process increases the scope and depth of topics studied in regular school math programs, and our innovative curricula and method of teaching is tailored to meet the individual needs of children. Our classes challenge children and keep them actively engaged in the learning process, and provide the means for parents to extend their children’s horizons. Advanced students are challenged beyond their experience in traditional classroom settings. Our classes allow a strong student to study higher level topics and progress at a faster rate. 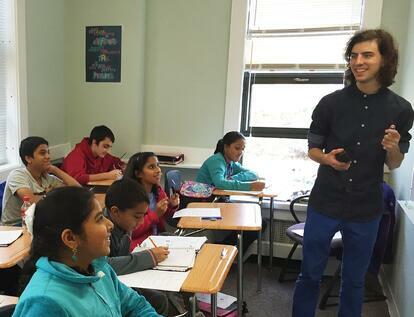 Our students have consistently posted top scores in international math competitions and on standardized tests, and have gained admission to top colleges. For students who are struggling in the regular classroom, we help them develop skills and build confidence so that they no longer look at math as a difficult subject. Tutoring, short-term remedial classes, and group classes are all offered, but there is no substitution for the classical teaching instruction in a classroom setting. Engaging discussions with teachers and peers, and a free exchange of ideas in solving difficult problems. Our small class sizes – max of 6 up to 1st grade and max of 9 in the rest – allow for individualized attention in a classroom setting. In most cases, students attend classes that correspond to their grade level in school. However, math skills and preparation can vary significantly, and it is important to match the student’s ability with an appropriate level of challenge. Free assessment tests allow us to properly place new students. We work with families to find a session that fits into their schedules. Starting as young as Preschool and Kindergarten, children begin to form the foundation for all their future math skills, so exposing them to the study of mathematics earlier in their school life encourages continuity of the subject and allows them to transition more easily into middle and high school. 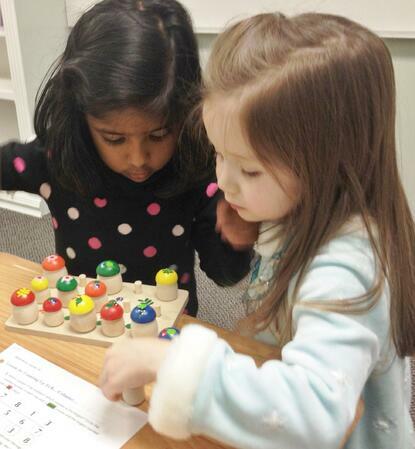 At the Pre-K level, students explore the concepts of mathematics, learning to count, compare, classify, and solve problems, while having lots of fun along the way playing mathematical and logic games and using manipulatives. Learning through play captivates children’s attention and helps them to understand abstract concepts later on. In Kindergarten, students develop a strong number sense, build early math skills, and learn to use math vocabulary. Children begin to develop logical thinking and spatial reasoning skills through a variety of fun, enjoyable activities. Children also love to solve our fun logic problems, which trains their creative and lateral thinking. The course of study in Levels 1-5 spans the entire elementary school curriculum. Students develop basic arithmetic and analytical skills. Elements of algebra and geometry are introduced. The emphasis is on word problems, logical reasoning, and mental math. Strong mental math skills allow students to quickly test several approaches to a problem, and determine which path leads to a viable solution. As students progress through the program, they continue to expand their computational and problem-solving skills, with a focus on underlying principles. Students who understand the material and practice it with concrete examples are more likely to retain the material. Our program is designed so that upon completion of five levels of Mathematics (MA 1-5) students are advanced to the Pre-Algebra and Introduction to Geometry courses. These courses prepare students for further study of Algebra and Geometry as separate disciplines. 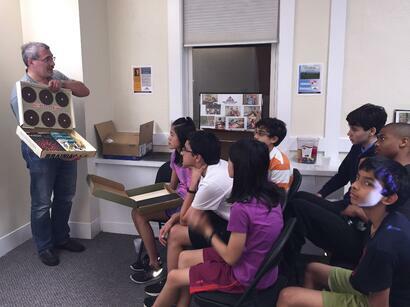 For students who need more strengthening of skills before moving on to Pre-Algebra, we offer an MA-6 class. In Pre-Algebra, students master decimals, fractions, percent, ratios and proportions, linear equations, inequalities, linear functions, and solve problems algebraically. We strongly believe that Geometry should be taught early and thoroughly. An early introduction to the systematic study of Geometry allows students to avoid anxiety and complications that some students experience later in high school when they are often overwhelmed with this and other subjects. 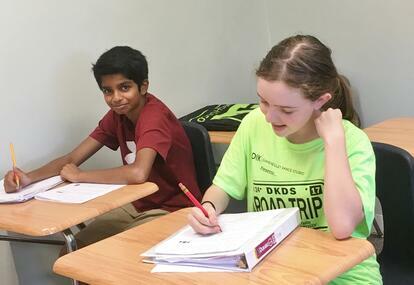 This progression of study is also beneficial for students who want to advance in middle school and are planning to participate in the Center for Talented Youth programs at John Hopkins University and the AMC-8 contests. 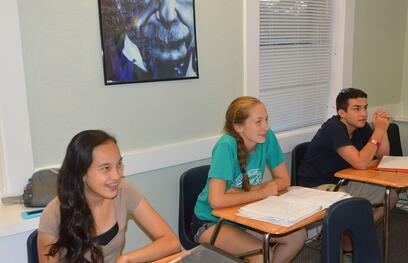 In Introduction to Geometry students are introduced to basic Euclidean principles, postulates, and theorems. Our 2-year Geometry I and II course offered in grades 7-9 serves as a solid foundation for high school Geometry Honors. Our Advanced Algebra course is a comprehensive 3-year in-depth program that covers all topics traditionally offered in middle and high school Algebra I and II courses. The level of difficulty of our Advanced Algebra course exceeds Honors Algebra, a class typically offered in public/private middle and high schools. At the high school level, students focus on higher level math - including Algebra, Geometry, Trigonometry, Pre-Calculus, AP Calculus, AP Statistics, and ACT/SAT review - in preparation for high school exit exams, college placement exams, and standardized college entrance exams.